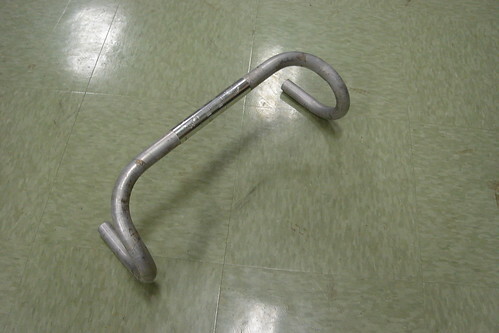 I was able to acquire this old 80’s-90’s handle bar yesterday from the old parts bin of RPM Cyclery for free! So on Saturday I took the bars to Jax Bicycle Center of Fullerton and had one of the mechanics cut it down for me into Bull Horn handle bars. Here’s how it’s done. The fella in the photos is Scott Moore, he’s the mechanic that did most of the work. 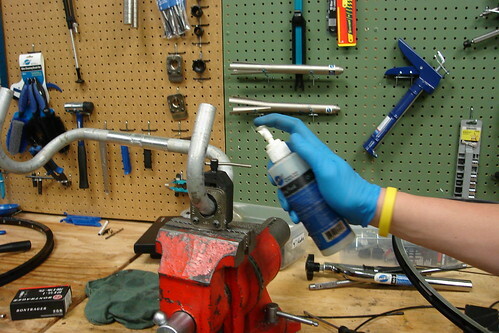 The first thing Scott did was spray some cutting fluid and placed the bars in a guide on the vice. Keep in mind I had already measured where I wanted the bars to be cut prior to this photo. Here’s a shot after a meeting with the hacksaw. Then Mike D (another mechanic) took the cut off piece and placed it on the other side to mark where the next cut would be made. Repeat the same steps above on the other side. After cutting the bars, Scott ran them through the grinder to smooth out the ends. 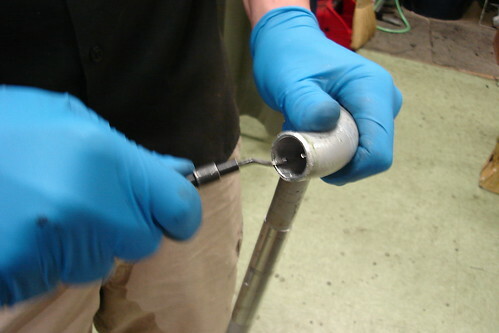 He also used a deburring tool to clean up the inside edges. Here’s a shot of the new Bull Horn bars on the Redline 925. Schweeeet! Scott also installed these gel padding things to go underneath the bar tape. 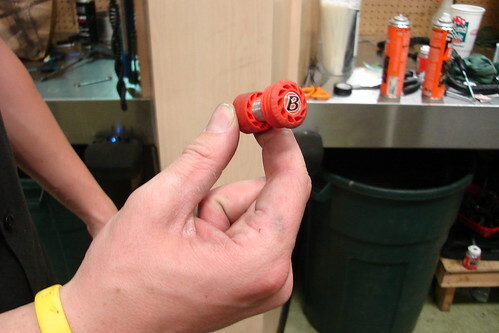 He also installed these Bontrager vibration dampening doo dads. Here’s how the bars are looking so far. Then I decided that the makeover needed something extra…or something less. So Scott removed the fenders and the chain guard, making the 925 look even cooler. It sure looks different from what it used to look like. Thanks again to Scott Moore of Jax Bicycles for all his help. I love the look and feel of bullhorns, and cutting an old pair of drops is the best way. I haven’t found a pair of off-the-shelf bullhorns that feel as natural as the pair I cut – most off-the-shelf models are too long or have unnecessary angles and kinks. I like ’em nice and narrow too – mine were made from a pair of 38cm touring drops. They also look great with time trial levers, which put the lever right in the right spot and don’t waste real estate with that huge ergonomic clamp, which really just gets in the way. You should find a pair of those and have them installed; you’ll probably like them better. Just a thought, RL, but judging by the height of your seat, I’m guessing your arms are at a shallower angle than mine – you might want to try angling the bars slightly up, so that your hands meet them at an angle more perpendicular to your arms. Might reduce strain on your wrists a bit. Thanks Nick. I actually did raise the angle of the bars a bit once I tried out the bike. The feel of the bike is so much better now. The 925 feels more agressive. Very, very nice. I was wondering if you guys could explain further on the break mounting. Nice proyect and post, RL. Sure thing, Alberto. What you see on RL’s bullhorns are standard road brake levers, which normally fit along the curve of the drop at the point where the bar is vertical. The large, bulbous mount has a horn shape at the hinge of the lever, which acts as a grip spot for the palm of your hand right at the root of your thumb. 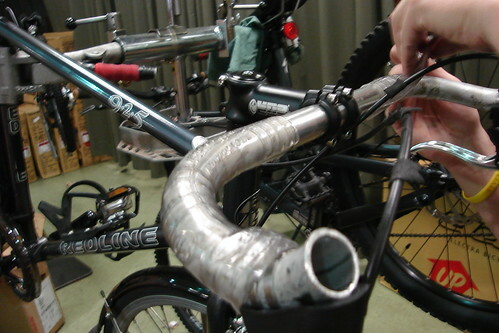 This allows a hand position on top of the bars, effectively the same as bullhorn bars. Now, if you attach the same levers to bullhorns, you have to move them further down, because bullhorns are cut off before turning vertical. You can still use the brake levers this way, but will be pulling more with your pinky and ring finger than your index and middle fingers, and you will be pulling at an awkward angle, unless you angle up your handlebars so that they are more diagonal than horizontal. The position of these levers are ideal for the standard hand position of bullhorn bars, where the crook of your thumb is against the end of the bar where it begins to curve upward. This way, your are pulling more with your index and ring fingers, and at a more appropriate angle. You also hide your cables by routing them inside the bars, which may require drilling if your drops were not drilled originally. I love using found parts and available materials, but I recommended these because I think RL would find them more comfortable and safer than the road levers. They are certainly lighter and less bulky, and have a sleeker look as well. We’ll see if he takes my advice! About the “Bontrager vibration dampening doo dads” what do you think about these after using them? do they help reduce vibration? Great looking bike. I’m planning on replacing the drop bars on my fixed gear, and had been thinking of moustache bars. But now I think I’ll first try these home-made bullhorns. One thought – what about using those brake levers that are designed for cyclocross bikes, and mount on the flat part of the bar? They’re designed to be a supplement to regular levers, but you can use them on their own. I spend most of my time riding with my hands on the bar crosspiece, so seems to make sense to put the brake levers there too. Course, might look a bit dorky. That is just what I have been thinking of doing for the bike I will one day build (I have the frame, parts, etc., just need a bit of help along the way. And motivation – I am inherently lazy). I’m glad to see they can look so good, and just how easily it can be done. I may have to try it out on the bike I am currently riding, because they just look so damn comfy! Great idea. I am doing this to a hybrid Marin. I am looking forward to the ability of aggressive downhill rides. That looks great, and I think that I’ll give it a go but I am curious if the time trial or aero levers would fit properly due to the bend in the bars, where the store bought bull horns are straight where the levers are. Cool looking ride! I just bought a 9 2 5 too. 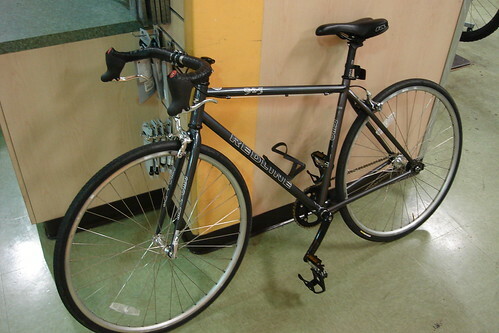 I did the same thing and lost the chainguard, reflectors, and added a Brooks saddle. 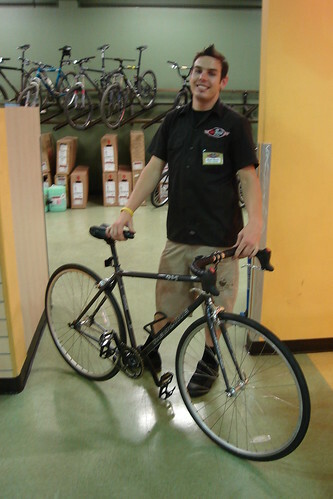 I’m going to do the same bar project on an old Nishiki road bike that is becoming a fixie. 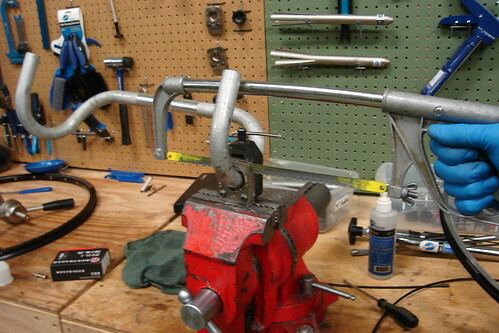 do you think the bullhorn style bars would work with campy ergo style brake/shifter levers.Iam curious. Love the bars and am just about to do the same, I have the aero brake levers to fit, just wondering where you would recommend drilling the holes for the cables to come out so it doesn’t weaken them, I’d imagine that drilling to close to the stem wouldn’t be the best idea due to the extra leverage therefore more stress, should i drill closer to the curve? hey man, i found to that if you flip the brake levers it adds for a nice look. just a little cleaner. works really good with older brakes to. what was the cost for having them cut the handlebars? nice one, i’ve had the same design on my tourer for a few years now but i have v-brakes with dia-compe 287v aero levers and i can stop with one finger on each lever with a fully loaded bike,(@80lbs) BUT, when i first put them on there was too much drag in the cables so i had to drill directly behind the lever, on the bar, where the cable exits the the ‘hood’ and again where the inner groove of the handlebar starts on the curve. this dramatically reduced drag and i have converted my other two tourers likewise…….great minds! did you find “cable drag” a problem? 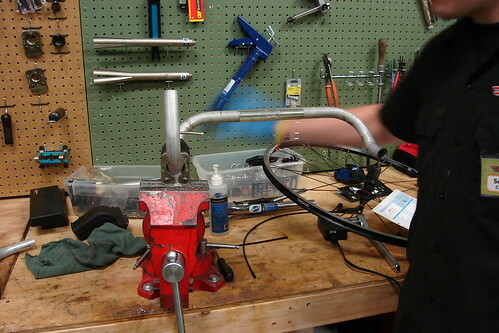 Ive done this but realized that pipe-cutters work much better than a hacksaw….much cleaner and much faster cuts. 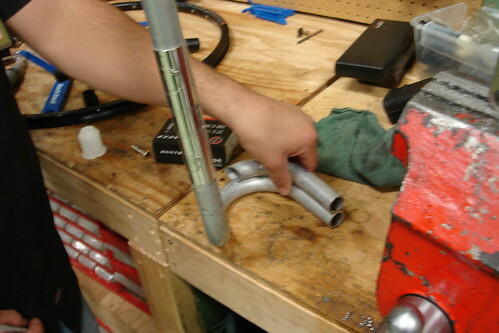 I just did this with my ’07 Cannondale Capo. After yet another close call with a car due to not being able to get to my brakes fast enough, I decided, that’s it! Now its comfortable and I have full braking power. And it didnt’ cost me anything. I wrapped the bar a little thicker so I didnt’ have to cut the tape. 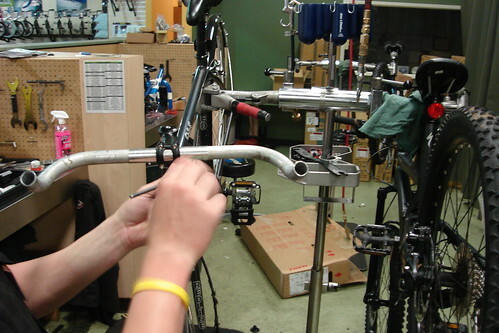 And only “problem” I ran into is that the brake cables can no longer be taped to the bar, but oh well. Its a commuter bike, not a fashion show. Thanks again. Thanks for the inspiration. Yesterday I finished bullhorning the bars on my 1989 Cannondale touring bike. It was pretty easy with a regular hacksaw and no vice. Without your blow by blow I might never have taken saw in hand. Thanks again. Man looks good. I would suggest looking at some time trial brakes instead. I have them on my fixie/singlespeed and they work great. “Man looks good. I would suggest looking at some time trial brakes instead. I have them on my fixie/singlespeed and they work great. is it at all possible to do this with a 24 speed? I’ve just fitted some charge slice bars (my old bars weren’t suitable for cutting down) and I do not seem to have enough travel in the brake/selector levers to pull hard on my brakes. 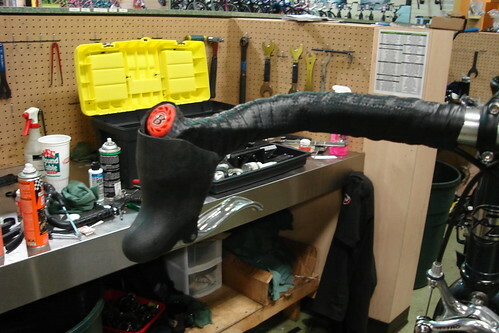 The levers currently have 55mm of travel, thats from the end of the lever to the bar. I was thinking of putting cyclocross levers on the bullhorns. May be another idea for others. Nice. Looks like me SE Lager fixie. I love the bullhorns, though I did move the breaks from the ends of the bars to the middle. Makes it much easier to signal. But a great looking bike, for sure. Just came accross this. Looks cool. I have done pretty much the same set up on an MTB so if anyone wants to run this with V-brakes then dia-compe do a really cheap lever called a 287V. Most levers like this can only pull calipers generally ! My ambition is to cut down some MTB bar ends and fit bar end shifters (where you have the orange plugs) but it’as going to need some clever welding. Open to any ideas to avoid the tig machine though !!! Why the hacksaw? 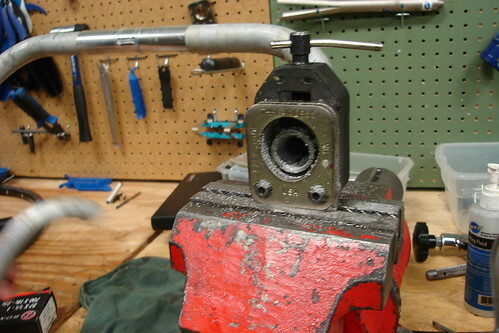 Isn’t a cheap pipe cutter tool way way easier? Love that bike. Take off the rear brake and put the fenders back on! just wondering , what were the measurements ?